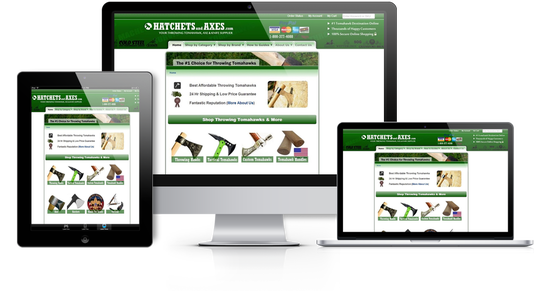 A niche corporation providing throwing tomahawks & axes to wholesale, distributor, and retail channels across the world. We are a corporation specializing in niche products customers are unable to find elsewhere. We specifically focus on cutlery and throwing tomahawks, axes & knives. Below you will find various platforms where these niche products can be found and purchased. HatchetsandAxes.com is the nations #1 low price leader throwing tomahawks to consumers, boy scout troops and military organizations. Throwing axes for lumberjack competitions. These double bit throwing axes are designed to win throwing axe competitions. ThrowingTomahawks.com is the worlds first luxury throwing tomahawk company. They provide custom designed hawks featuring some of the finest craftsmanship around and are often purchased as award tomahawks for the Boy Scouts of America Eagle Scout Award as well as various military achievements. © Copyright 2014. WeHawk.com. A Division of KCW Holdings, LLC.